I have always had a fascination with Sacred Harp singing, and though I've never experienced it myself in its traditional, most pure sense, have sung many of the hymns. At my old church job, was the oldest - and only colonial church built in Washington, D.C., we were visited as much a history buff's destination as a worship place for the parishioners. As such, in addition to the rich Anglican literature we frequently performed music of the colonies and early America, and I was always happy when the Sacred Harp came out. 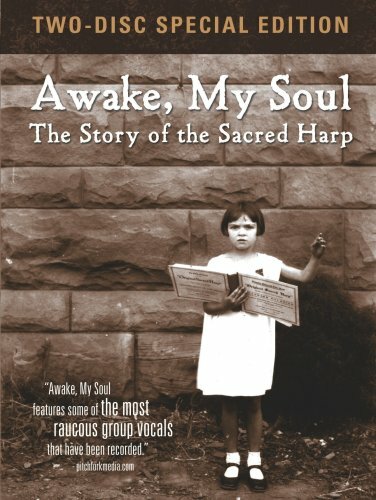 A few years ago a friend in Georgia told me about a documentary that featured his Sacred Harp group, about the history of Sacred Harp/Shape Note singing, etc. but I never heard any more about it. Somehow I missed the original airing on PBS, but a few weeks ago stumbled across a site that mentioned this documentary "Awake My Soul" and I had to have it. What an amazing, thoughtful, fascinating and uplifting film this is. Filmmakers Matt and Erica Hinton, devotees of this music, are aided by a wonderful assortment of Sacred Harp singers, young, old and in between, who are part of the tradition for myriad reasons. To hear this music, sung like this makes me realize how much we've lost as a culture by forcing this music away and out into the backwoods of our country. In the early 20th century one could find almost nothing about this music, and in the 1920's a German Professor at Vanderbilt University, musicologist George Pullen Jackson stumbled into it only to be amazed that this "Lost Tonal Tribe" still existed in the country. He wrote, "The nation's earliest music had been preserved not by the universities and institutions, but by unschooled country folk." The worldwide cultural associations with this music are rather amazing. Anyone interested in true world music, and hearing this for the first time will hear remarkable similarities with a variety of music including medieval, middle eastern, Spanish, and influences of Byrd and the other great British composers of his day. A friend remarked "It sounds like that 'Mysteries of the Bulgarian Voice' album you dig so much." And it does, but it shares, I believe, the melting pot qualities of other early European music, French dance music, the sometimes otherworldly modal harmonies, the double dotted rhythms, parallel fifths, etc. It's almost a little dangerous sounding, which is, I think, part of it's enticement. The singing is loud, violent and emotional. The singers arranged in a square, with the leader (a different leader every one or two songs) sing full voiced and strong with the motto "If you can hear your neighbor, you're not singing loudly enough" - strictly enforced! The harmonies are unusual and beautiful, and most of the singer's faces reflect their heartfelt association with the text and the tune. It's an amazing thing to watch and hear - but which may put some off, and frighten others. More than once does the brutal quality of the full, open-throated singing arise, with one young teenage singer stating how it's just about the opposite of what any voice teacher or choral conductor would instruct. Amen! The Hinton's did their research on Sacred Harp singing and more than just a "feel good" piece, they delve into a little history of shape notes, going back to 11th Century Italy and the monk Guido of Arezzo's development of his hexachord system for musical notation. They speak of the movements earliest New England roots, fuguing tunes, composers, such as Billings who infused this tradition with such beautiful music and harmonization, and how efforts by the likes of Lowell Mason and the Better Music movement drove these traditions out of New England, and how it was bruised and battered, kept alive almost in secret society fashion in America's deep south. They also go briefly into the Singing Schools that popped up all over the country at the time, teaching people how to learn to read and sing this music. This part of the film has some wonderful photographs, including some of the covers for the songbooks of the time, one particular one standout for me was the hymnal whose cover reads: Genuine Church Music Comprising A Variety of Metres All Harmonized for Three Voices Together with a Copious Elucidation of The Science of Vocal Music by Joseph Funk I want a copy! The interviews are splendid, the reasons for participation vary, though most are religious, as are the bases of this music itself, but it's appeal is infectious regardless of one's religious (or anti-religious) leanings. (My friend who's been involved forever, is an atheist - "But I can't keep away from these people. We all love each other" he's told me). One of the most powerful statements comes from a gentleman who asserts how, in modern life, most people in can only experience art as an outsider: going to museums, concerts, etc., and never can know the perspective of being a participant in the creation of something. The 2 disc "special edition" is worth getting - with well over 4 hours of extra features, including 2 hours of selections - some 60+ songs - videotaped live at Sacred Harp "Singings" in a variety of locations, while the directors were researching. Additionally, for those who fear they may not understand some of the deep south accents, the whole thing can be watched with subtitles. What a powerful, beautiful, film this is. There were moments, the music took hold of me and shook me to my very core. For anyone even remotely interested in Americana and American musical history, this film is a definite must see. Elementary? More like "by the numbers."